Coaster Photo – Michael and Melinda Casey are a husband and wife team working as police officers in Asbury Park. 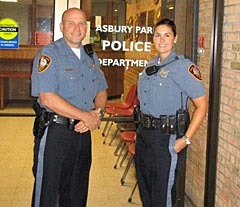 Asbury Park Police Officers Melinda and Mike Casey have the same surname, badge numbers in sequential order — hers, No. 219; his, No. 220 — and have both been on the police department for 11 years. They have been married for even longer: 16 years. “We decided to take the (state) Civil Service test together,” said Melinda, 41. Their scores were close to each other’s, they went to the Monmouth County Police Academy together. Both have families with emergency responder backgrounds: Mike’s father, Jack Casey, is a retired Newark firefighter; Melinda’s younger brother, James Macomber, is a patrolman for the Port Authority of New York and New Jersey, while her father, also James Macomber, is a retired captain with the Hudson County Prosecutor’s Office. Melinda’s father would talk about his work. In taking the Civil Service test, according to Mike, who is 43, “we opened our options up to anything.” Asbury Park Police had openings and both got hired. Both are in visible positions on the police department: Melinda as a patrolwoman and Mike as a member of the Community Relations unit. Mike also is a spokesman for the department. The couple — which lives in Melinda’s hometown of Aberdeen and next to Mike’s hometown of Old Bridge — have four children: one boy and three girls, ages 2 to 14. When the two are off-duty, according to Mike, “it’s pretty much family time.” But the husband-and-wife co-workers talk cop stuff at home. “We understand each other,” Melinda said. They also talk cop stuff with Melinda’s father and brother. “We, all, have stories,” Melinda said. Both Melinda and Mike said their likes about the job center around people they encounter. “I love being out with the people, public, meeting everyone,” Melinda said. “Helping people. I love kids, I love seeing the little kids. Mike looks to his job as “being able to help” people. Both said they enjoy the jobs there are assigned to, for both of them about seven years. In his job in Community Relations, Mike serves with others in the unit as a face of the department, doing work with schoolchildren, for example. “Just the effect we have on people,” said Mike, who has worked in the past on patrol, internal affairs and training. In their 11 years on the department, they have seen the city improve. “I like to think we played a part in that, cleaning up the streets,” Mike said. And, yes, the couple worries about one another on the job.